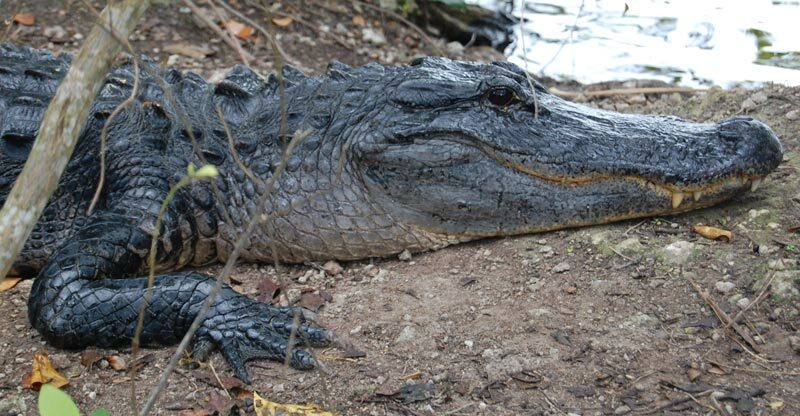 If you’re heading to that freaky swampland in South Florida, you’re probably wondering… Where’s the best place to see alligators in the Everglades? On my recent trip to the Everglades, I got so close to multiple gators I could have reached out and touched them (if I wanted to risk having my hand bitten off, of course.) This is my chance to pass along a few tips regarding the best place to see alligators and other wildlife in the national park. 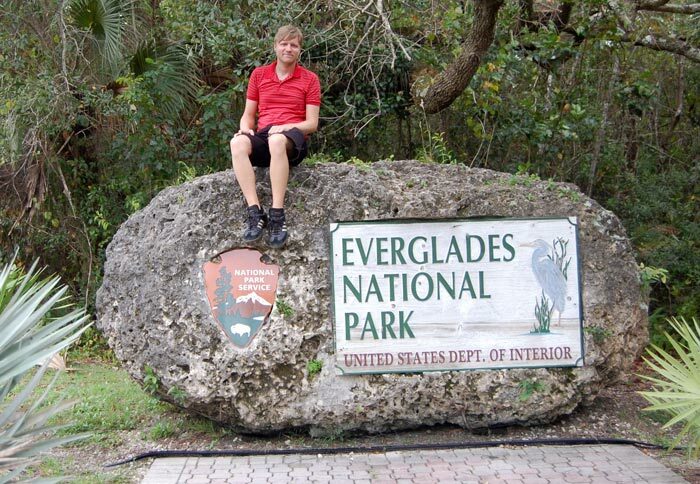 Everglades National Park is the third-largest national park in the lower 48 states, behind only Death Valley and Yellowstone. 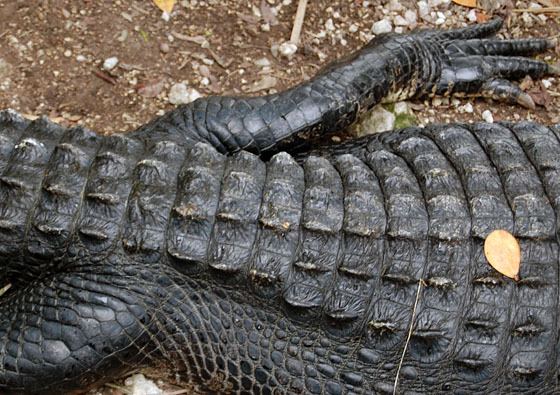 It’s the only place in the world where alligators and crocodiles co-exist. Most of the Everglades is unreachable by car or foot because it’s so swampy. In fact, only a couple of roads go into the park at all. There’s a 99-mile-long Wilderness Waterway on the west side of the park that can be ideal if you want to kayak or canoe in the backcountry. Otherwise, you’re stuck on one of the established roads. 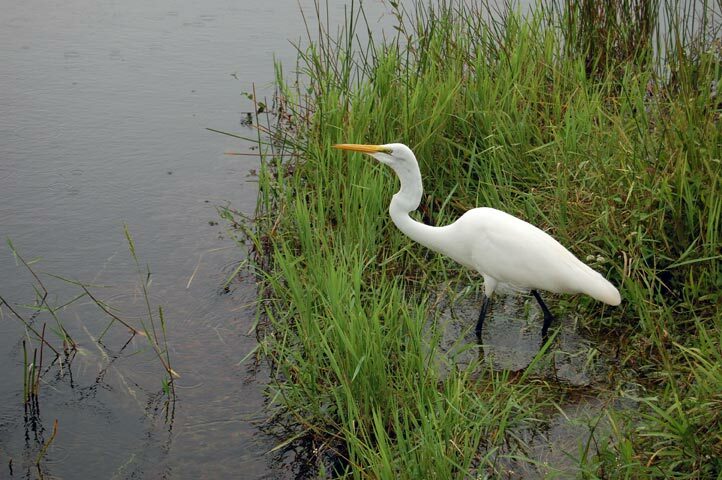 I can tell you that without a doubt, the most prolific animals in the Everglades are the mosquitoes. Without a strong DEET repellent, they are almost unbearable. These mosquitoes are violent! I got out of the car for literally two minutes to take this welcome photograph, and when I got back inside I discovered that, in addition to the loads of bloody, dead mosquitoes I had smashed on my skin, I had acquired about a dozen huge bites, including four on my face. Thanks goodness my hair was long enough to cover my forehead, or I would’ve spent the rest of the weekend looking like an acne-riddled teenager. Fortunately, the welcome centers sell repellent, for people like me who forget to bring their own. The Shark Valley and Ernest Coe visitor centers are two of the most common entry points into the park. 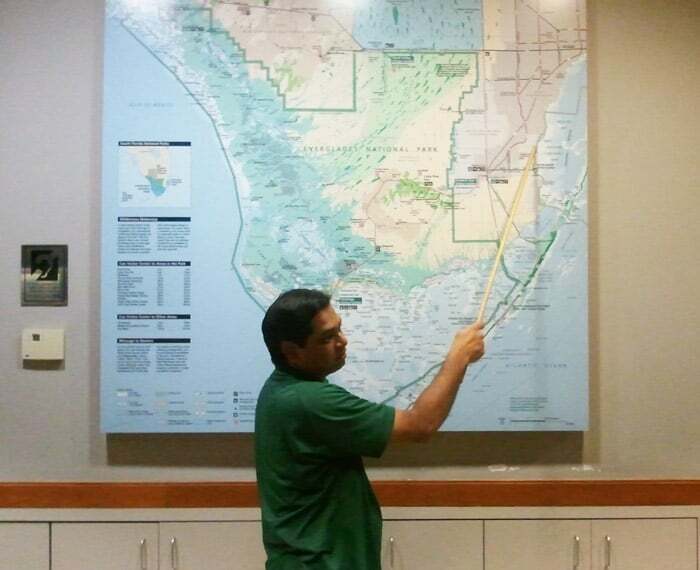 We stopped by the Ernest Coe center in Homestead to pick up maps and information from the rangers about where to see alligators. You can take airboat rides in the Everglades, but I was not eager to do that because many people feel the rides aren’t environmentally friendly, since they take crazy-loud vehicles into otherwise peaceful and unreachable areas of the Everglades. A more eco-friendly option is the tram that runs on a set path near the Shark Valley visitor center coming into the northern edge of the park along Route 41. 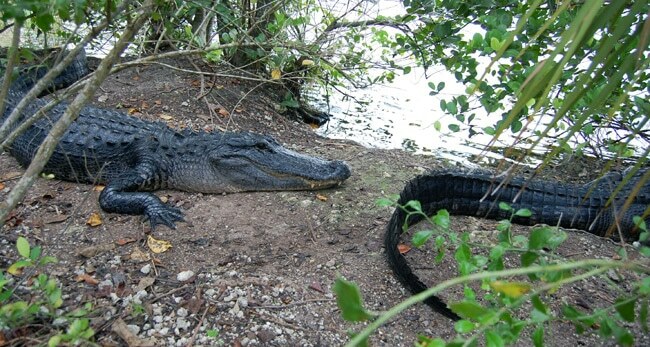 You have a good likelihood of seeing gators on the tram trips, but you won’t be able to leave the vehicle, so you’ll have to settle for a far-away view. 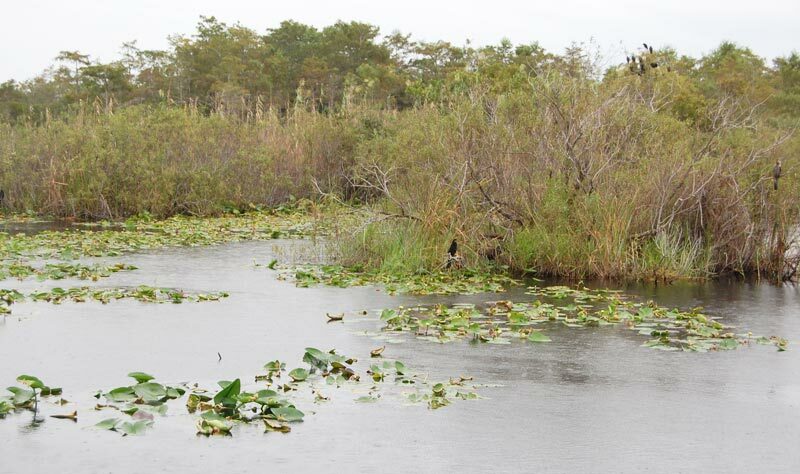 For the best chance of seeing them up close, the ranger suggested we check out the Anhinga Trail at Royal Palm, just a short drive from the Ernest Coe Visitor Center. The Anhinga Trail is one of the most popular trails in the park. It’s a half-mile long path that weaves its way through a sawgrash marsh on an elevated platform. You can walk on the boardwalk and look down at the water and the vegetation, attempting to spot alligators as you go. We took the left fork of the trail and followed it around, seeing no gators until we got near the end. As we went around a bend near a gazebo-like structure jutting out into the water, a passer-by pointed out a gator chilling at the surface of the water. My first alligator sighting! Score! We watched for a few minutes, but it didn’t do much. A bigger score came a couple of minutes later, when we followed the wooden path to its dead end. Right next to the trail sat three gators in a near-perfect single-file line. 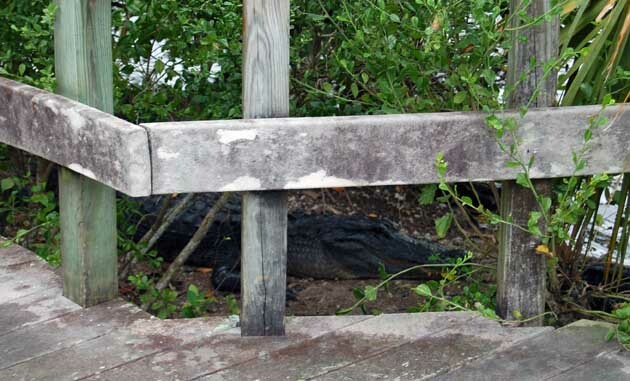 The gators lurked just behind the wooden fence. They were underneath the small trees, staying dry and avoiding the raindrops. The gators were literally a few feet from me. At that moment, I was so thankful I hadn’t opted to pay $15 to ride the tram, because this close-up experience was a million times better. From this distance, I was fascinated by examining the scales and the humps in great detail. The alligators sat perfectly still, even as lots of Everglades tourists gathered around and took photo after photo. They were probably around 10 feet long each. There’s no guarantee gators will always be in this exact spot, but it seems to be one of their favorites. 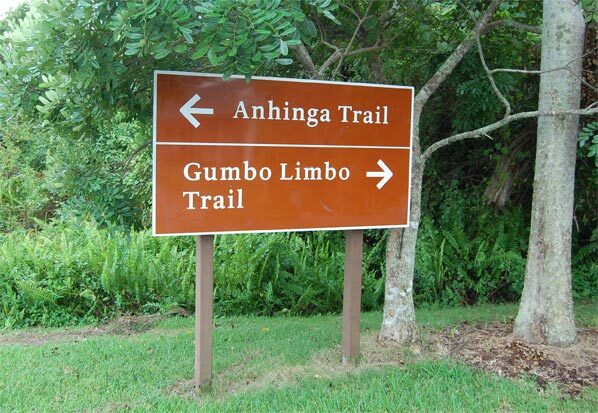 To reach it, start on the Anhinga Trail and keep walking straight, avoiding all of the forks in the path. When you reach the very end, look around on all sides to see if any gators are nearby. Or, just follow the crowds of people. The tourists always follow the gators! I’ve never been a big fan of birds. I always skip the bird section at zoos. They’re just not unusual enough for me to care. But I admit that seeing a lone ibis, with its brilliant white feathers, standing in the swampy water was a beautiful sight. I almost began to develop a soft spot for these creatures. Photography enthusiasts can find lots of birds throughout the park, but particularly at the Anhinga Trail. You’ll also see vultures in the parking lot at the Anhinga trailhead, along with warning signs that these scary-looking birds may damage your car. Turns out they like to gnaw on windshield wipers. If it’s turtles you’re after, Anhinga is also a good bet, though I didn’t personally encounter any. Manatees exist within the Everglades, mostly in the deeper water accessible by boat. Collisions with watercraft are the biggest threat to Everglades manatees. So that leaves crocodiles and panthers. 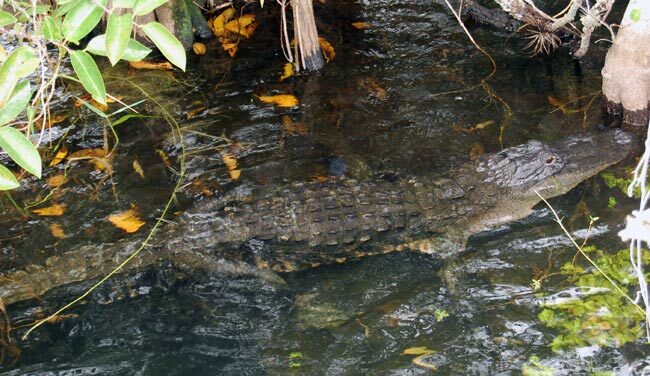 I have no first-hand knowledge about where to see crocs, but from what I’ve read, they are more secretive creatures than alligators and prefer the coastal areas that would be accessible by boat. And where’s the best place to see panthers in the Everglades? Well… good luck with that. Panther sightings are extremely rare anywhere in Florida, so it’s going to take luck more than skill to see one. It’s estimated there are only 100 of these creatures left, and most live north of the park in the Big Cypress National Preserve. None are believed to live in the Everglades, but they do pass through on occasion. 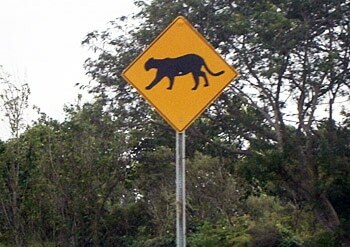 That said, there are panther crossing signs along the main road (Rt 9336.) Just don’t get your hopes up! I never saw aligators or crocodiles in person, so it could be fun if I get to go there one day. Do you know if there are bird-watching trips with rangers in the park? Good question, I’m not sure about that. I don’t remember seeing anything like that, but I went before the start of peak season so they probably have more programs going on now. The only place where alligators and crocodiles mix? Now that’s interesting! I’m really interested in visiting Yellowstone next time we’re in U.S., now that you’ve featured this, we might head there as well if we get to visit the state. I love national parks! 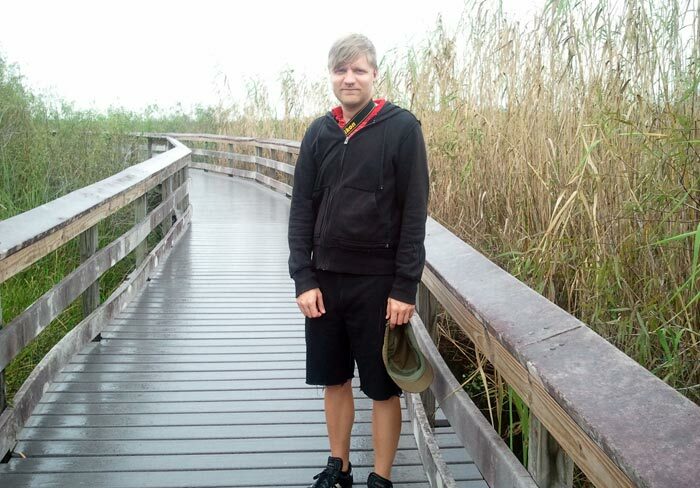 Everglades is a cool park because it’s so unique! The Anhinga Trail is AWESOME! When we first walked up to the beginning of the trail, there was a massive alligator just on the other side of the low cement wall (near the bathrooms). I could have leaned over and touched it. And I agree that the best place to see them is straight down to the very end of the boardwalk — there was a large open pond with dozens of gators climbing all over each other and stalking birds. Priceless. It sounds like you saw a lot more than I did, Christy! The number of gators probably depends on the time of year but at least that’s the best spot to find them.